In British Empire, the Privy Council heard appeals from courts of over 150 countries and applied not merely English Law but diverse systems of law. The judicial functions of the King-in Council or the Privy Council as it was generally called, assumed critical importance across colonies and dominions. With respect to India, the Privy Council or the Judicial Committee of Privy Council (JCPC)(as it was officially called after 1833) acted as highest court of appeal for close to two centuries. It made a significant contribution to stabilising the legal system and consolidating precedents on common law principle and hence, PC occupies a seminal place in shaping indian legal history. In 1726, for the first time a right to appeal to King – in –Council from courts in India was granted. The Royal Charter made provisions for a right to appeal to King-in- Council from Mayor’s Court in three Presidency towns. However, appeal was allowed only in cases involving more than 1,000 pagodas and the appeal could be made within 14 days from when judgment was ‘entered of record’. The Regulating Act of 1773 replaced the Mayor Court in Calcutta with the Supreme Court which first time explicitly provided right to appeal to King-in-Council. Section 18 of the Act read, “any person thinking himself aggrievedby any judgment or determination of the Supreme Court at Bengal, should and might appeal from such judgment or determination to the King-in-Council, within such time in such manner and in such cases…., as His Majesty, in his charter, shall judge proper and reasonable..”Thus, even in 1774, the charter did not articulate clear principles which will allow appeal to King-in-Council and it was discretionary. The Mayors’ Court at Madras and Bombay gave way to Recorders’ Court which were governed by provisions analogous to Calcutta Supreme Court for appeal to King-In-Council. Between 1726 to 1833, around 300 appeals were disposed of by the Privy Council. Most of these were appeals from Mayor Courts and Supreme Court in three Presidency Towns. The nature of dispute mostly related to testmentary and inte-state succession, debts on promissory notes, insurance on sea-cargo etc. The constitution of the Privy Council was majorly reformed in 1833 by Lord Brougham as on 14th August, 1833, the British Parliament enacted the Judicial Committee Act, “ for better administration of justice in His Majesty’s Privy Council”. A ‘Judicial Committee of Privy Council’, constisting of Lord President of the Privy Council, Lord High Chancellor and some ex-officio members (position occupied by vitue of official posts) was constituted There was also a provision for appointing two members who held Judicial office in India or any of the dominions to attend the sittings of the Judicial Committee. However, their role was restricted to acting as accessors without any voting rights. Appeals were referred by His Majesty to the Judicial Committee and following the hearing, Committee made recommendations to the King-in-Council for his decision. The quorum of Judicial Committee of Privy Council (JCPC) was fixed at four and the reasons for every judgment were read in open court. The privy Council was unparalled as an institution as its range of jurisdiction ranged many dominions, colonies and plantations. Such was the scope of its jurisdiction that it embraced the legal interest of 1/5th of human race at one time. For its links subsiting to over two centuries, it played a great role in consolidating legal principles despite myriad cultural-religious diversity. It was through Privy Council that common law principles were encouraged and stimulaed in Indian jurisprudence. For instances, principles of “justice, equity and good conscience” into Indian jurisprudence is owed to Privy Council decisions. However, it must be appreciated that the judges of Privy Councils applied the personal and family laws and differential religious laws to Indian disputes and rarely supported their understanding of law to disputes rooted in specific socio-cultural context. In the period speanning the initial years of Independent India (1947-1950), certain gradual steps were taken with a view to eventual abolition of appeals to establish the Supreme Court. The first sep was taken by enactment of “Federal Court (Enlargement of Jurisdiction) Act I of 1948 which abolished direct appeals from High Courts(set up under GOI 1935 Act) to Privy Council bypassing the federal Court(set up under GOI Act 1935). However the 1948 did not sever India’s ties with the Privy Council as appeals could still be mad eto privy Council. Finally, the Abolition of Privy Council Jurisdiction Act was passed on 24th September, 1949. Post this enactment, the limited power to appeal was abolished. The last appeal from India, N.S. Krishnaswami Ayyangar v Perumal Goundman was disposed of by Privy Council and with this, came to an end the two centuries long connection to the Privy Council. On 26th January, 1950, the federal court gave way to the Indian Supreme Court under the new Constitution. The initial bench comprised of the first Chief Justice of India, Sir H.J. Kania and 7 other judges. The Indian Supreme Court was inaugrated on 28th January, 1950. The jurisdiction of the Supreme Court can be categorised as – Original, Appellate, Extraordinary Appellate, Advisory and Plenary. (a)Citizens and other persons can enforce fundamental rights by filing petitions under Article 32 for directions, orders or writs (Habeas Corpus, Mandamus, Certiorari, Prohibition, Quo-Warranto). (c) Article 139 A(1) – Cases involving the same or substantially same question of law pending before any High Court or another bench of Supreme Court can be transferred to the Supreme Court. (d) Article 139 A(2) – In the interest of justice, the Supreme Court can transfer cases from one High Court to another. (e) Article 71 - Any election disputes with respect to President or Vice President shall be heard by the Supreme Court. 2. 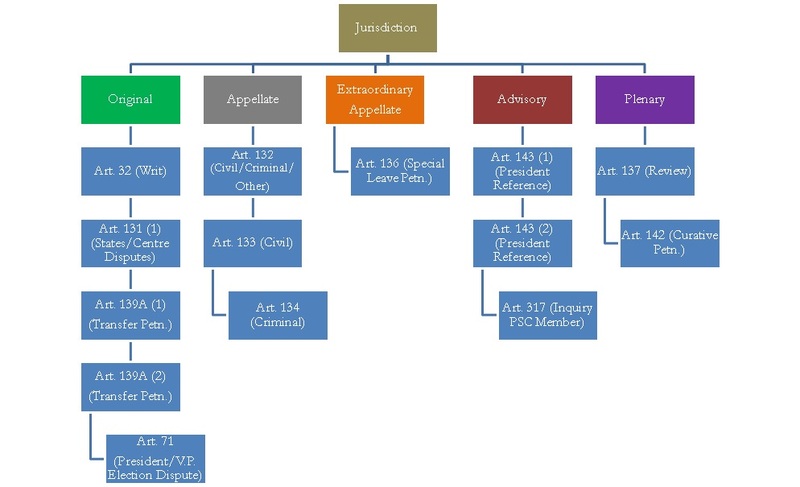 Appellate Jurisdiction – Appeals from High Courts are permitted under Articles 132 (Civil, Criminal or Other), 133 (Civil) and 134 (Criminal) of the Constitution. 3. Extraordinary Appellate Jurisdiction – Petition for Special Leaves to Appeal can be filed under Article 136 of the Constitution. (a) Under Article 143(1) the President may refer to the Supreme Court on a question of ‘law’ or ‘fact’ of public importance. However, the Court can decline this Presidential Reference. (b) Under Article 143(2), the President may refer to the Supreme Court, on disputes arising out of pre-constitutional arrangements in the form of a treaty, agreement, covenant or other similar instruments. (c) Under Article 317, the President may refer to the Supreme Court an inquiry for removal of Chairman or any member of Public Service Commission. (a) Review under Article 137 – Supreme Court has the power to review any judgment or order pronounced by it. (b)Curative Petition under Article 142 – Any person can file this petition to cure “gross miscarriage of justice” or “prevent abuse of process of law” through a judgment of Supreme Court. The grounds for filing curative petition have been laid down in the case of Rupa Ashok Hurra v. Ashok Hurra. A postponement of proceedings for a period of time. Ab Initio is a Latin phrase that translates to "from the start". An appellate Court is said to have affirmed a decision when it agrees with the verdict of the lower court. A legal document in which the individual swears under oath before a notary or someone authorized to take oaths that the statements made in the document are true. This is a nonbinding interpretation of law given by the Court on a question of law or fact that is of public importance and referred to the Court by the President of India. The latin term for "in good faith", it is used to signify the honesty and absence of any fraudulent element in claims made by a party. When one or more judges agree with the majority judgment but wish to write separate reasons for why they agree, they are said to write a concurring judgment. A bench of the Supreme Court consisting of five or more judges. The term originates from Article 145(3) of the Constitution which states that "any case involving a substantial question of law as to the interpretation of [the] Constitution" must be decided by a bench of a minimum of five judges. A writ of superior court to call up the records of an inferior court or a body acting in a quasi-judicial capacity. When one or more judges disagree with the majority judgment, they may record their reasons for their disagreement. A dissenting judgment cannot be enforced. Ex Parte proccedings refer to hearings or orders granted on the request of and for the benefit of one party only in the absence of the other party. A writ of Habeas Corpus is used by the courts to find out if a person has been illegally detained. If a person has been illegally detained, a writ of Habeas Corpus can be filed. Habeas Corpus is Latin for ‘Let us have the body’ (in this context - let us see the person who has been illegally detained). Through Habeas Corpus, the court can thus also summon the person detained or imprisoned to the court. This writ petition can be issued against a public authority or any particular individual. A temporary order of the Court that remains in force until the next hearing, the performance of an act by one or both parties, or a final order of the Court. An act is said to be intra vires when it is performed by a competent authroity within the scope of its power. A non-party to a case that is allowed to be brought on record by the Court at its discretion without the permission of the parties to the litigation. The act of bringing a third party to a litigation who may be liabke to the petitioner or is likely to be directly effected by the outcome of the case at hand. Latin for "place to stand". It menas the right of a party to bring forth an action, to be heard by the Court, or the right to address the Court. The opinion of the numerical majority of the judges in a case is known as a majority judgment. This judgement becomes part of the law of India. A writ of Mandamus is issued by a higher court to a lower court, tribunal or a public authority to perform an act which such a lower court is bound to perform. If a public official is not performing his duty, the court can order it or him/her to do that. Mandamus is Latin for 'we command'. It can be issued against anyone, including the president or governor of the state, a private person or chief justice. Any individual or a private body who has a stake in the issue can file a writ petition of mandamus. A formal letter given to a party to respond to the arguments made against them or petition/appeal filed against them. A person files a petition in the Court. For example, in Subramanian Swamy v. Union of India, Mr Subramanian Swamy was the Petitioner. A writ of prohibition or a ‘stay order’ is issued to a lower court or a body to stop acting beyond its powers. The writ of Quo Warranto (Latin for 'by what warrant') is issued to inquire about the legality of a claim by a person or authority to act in a public office which he or she may not be entitled to. The writ is only for public offices and does not include private institutions/offices. All parties to a case who are not the petitioner are referred to as respondents. It is important to note that Respondents are not necessarily opposed to the Petitioner(s). For instance, in Subramanian Swamy v. Union of India, various free speech organisations were listed as Respondents even though they supported the Petitioner in the case. The act of a Judge to remove or excuse himself from hearing a particular case owing to conflict of interest. An issue finally decided on its merits by a court having competent jurisdiction can not be subject to litigation again between the same parties on the same facts. The revocation of a statute by the enactment of a a new law by the legislature. A Review Petition is filed by parties aggrived by a decision of the Court seeking review of the judgment on any apparent error. A Special Leave Petition is an extraordinary power granted to the Supreme Court of India under Article 136 of the Constitution. This Article grants the Court the power to hear an appeal against any order passed by any court in any part of India. The vast majority of the cases before the Supreme Court are Special Leave Petitions. Suo motu means "on its on motion" in Latin. When the Court takes up a Suo Motu Petition, it takes the unusual step of taking up a case, even though no party has filed a relevant petition. An act is said to be ultra vires when it is performed by a competent authroity beyond the scope of its power and contrary to the Constitution. A writ is a formal written order issued by a Court. Any warrant, orders, directions, and so on, issued by the Supreme Court or the High court are called writs. A writ petition can be filed in the High Court (Article 226) or the Supreme Court (Article 32) of India when any of your fundamental rights are violated. The jurisdiction of the High Courts (Article 226) in issuing a writ is wider than the jurisdiction of the Supreme Court. The Supreme Court can issue writs only in relation to the violation of a fundamental right. There are five kinds of writs: quo warranto, habeas corpus, mandamus, prohibition and certiorari.